People with confidence are more successful in life. Others are inspired by them and follow their lead. They have an easier time taking risks and are resilient in the face of failure. Everyone wants this type of self-esteem, but not everyone has it. If you are struggling with your faith in yourself, here are some ways you can start raising your self-confidence today. Comparing yourself to other people is unhealthy. Whether you are scrolling through your Facebook feed with the green-eyed monster by your side or you can’t stand listening to your best friend talking about her happy relationship, if you are always using others as a measuring stick for your own success, you’ll never be content. The more envy you experience, the less content you are with yourself. Life isn’t a competition. Next time you find yourself comparing yourself to someone else, remind yourself that it isn’t helping you. Do you have anyone in your life who always seems to be putting you down? It’s time to evaluate how important this person is to your life. Anyone who is constantly negative and makes you feel bad about yourself isn’t doing you any favors in terms of helping you with your self-esteem. Create some space from this person and see if that helps you, and work on making more room for positivity. Even if you aren’t feeling too positive yet, something as subtle as reframing your thoughts to focus more on solutions than problems can help you have a positive frame of mind. It’s hard to be confident when you are constantly being harsh with yourself. Self-criticism doesn’t motivate you to get better; in fact, it has quite the opposite effect. Cut yourself some slack when you make mistakes and it will be a lot easier to try again. It might help to try talking to yourself as though you’re talking to your best friend. Would you call them a failure who ruined everything? Probably not. Show yourself a little compassion and it becomes a lot easier to feel more confident. Just because you’re not feeling confident in your mind, doesn’t mean that you can’t project confidence. In fact, changing your body language to project an air of confidence can make you feel more empowered as you see how people’s perception of you changes. You appear more confident when you stand up straight, look people in the eye, and smile. There is nothing like a flattering haircut to boost your self-image. If it’s been awhile since you tried something new with your look, now’s the time to take the leap! Try a new cut or color, get that tattoo you have been dreaming of, or try a new outfit on for size. You’ll be surprised how simply changing up your style can give you more confidence. If you have been abusing your body, it’s hard to feel good about yourself. Low self-esteem often causes people to turn to unhealthy coping mechanisms, which in turn make them feel even worse about themselves. Taking care of yourself makes you feel better about yourself. Eat healthy foods, exercise, and make sure you are getting plenty of sleep. Put yourself first. If you’re looking for a way to practice self-care, why not try one of our facials in Chelsea? 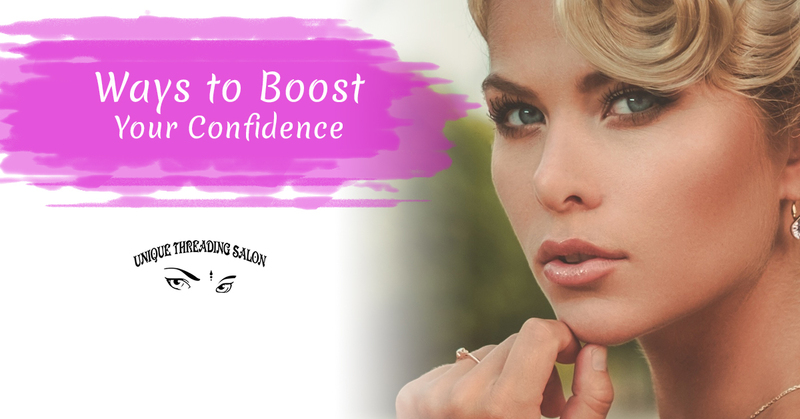 At Unique Threading Salon, we can pamper your skin to give you that confidence boost you seek. Book your appointment online today!